And that which you are looking for I hope you find. This poem was written by Chrisalis. 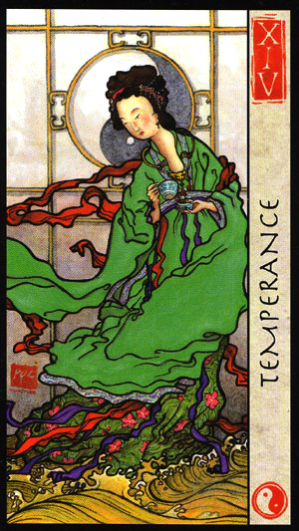 Today’s card — Temperance — is from the Feng Shui Tarot series by Eileen and Peter Paul Connolly, published by US Games. Eileen is a prolific writer who has penned several other tarot books and has joined forces with her son Peter Paul once before on the Connolly Tarot. Both are highly recommended.